Planning and celebrating a loved one's 50th birthday is a task not to be taken lightly. Reaching the half-century point is no small milestone by any means. Plan a special dinner to commemorate what the new 50-year-old means to you and how remarkable you feel his or her birthday is. Make an elaborate seafood feast if she enjoys seafood. Start with shrimp cocktail or caviar as an appetizer. Move on to lobster tails or crab legs with garlic butter for dipping. Pair it with scalloped, roasted or mashed potatoes. Add a vegetable side such as a roasted vegetable medley or a vegetable stir fry. Rice is another side that goes well with many seafood dishes. For a birthday celebrant who loves spending every Sunday behind the barbecue grill, consider a barbecue bash where someone else does the grilling for a change. If he's adamant about grilling his own meat, have everyone else bring his favorite side dishes and desserts. Purchase his favorite meat and let him man the grill. If she's a lover of Italian food, prepare her favorite Italian dish such as lasagna or cheese ravioli in a rich marinara sauce. Shrimp or chicken fettuccine with Alfredo sauce is another Italian hit you can prepare. Make a salad of mixed greens and include vegetables as a side. Try a new recipe or pair the dish with a special wine, such as Chianti Riserva, to make it worthy of the occasion. Burgers and french fries work just fine for a casual party where his closest friends and family join him, if that's his favorite meal. Try to add something to mark the occasion from a typical weekend cheeseburger dinner. For instance, use a new recipe such as the Mar-a-Lago turkey burger shown on "Oprah." Dress it up with homemade gourmet macaroni-and-cheese or cold pasta salads. Another idea is to make it just the way he likes it, but serve it on your finest china. For a themed party, such as a luau, carnival or fiesta theme, choose foods that fit into the theme. Luau-themed parties could offer roasted pork (roast it over an open fire as the Hawaiians do it), pineapple and coconut-embellished foods. Fiestas might make use of chicken enchiladas, refried beans and Spanish rice. Carnival-themed parties would be the perfect place to serve buttery corn-on-the-cob, corn dogs, deep fried cheese-on-a-stick, cotton candy and chili cheese fries. 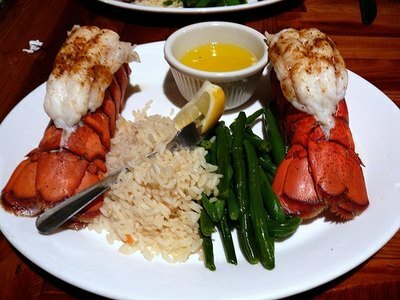 Twin lobster tail dinner prepared at Cap'n Jacks Restaurant. Consider setting up a buffet so guests can easily serve themselves. Serve three or four different types of meat prepared different ways. For example, baked lemon pepper chicken, Swedish meatballs, barbecue pulled pork and shrimp scampi. Offer vegetables, fruits, salads and potatoes prepared a couple of different ways. Include a meat-free dish for vegetarians. Another option is to hold the party at her favorite restaurant or have the party catered. If her favorite restaurant doesn't seem special enough to celebrate her 50th birthday, think about her favorite type of food. If she loves French cuisine, consider taking her to the nicest French restaurant within driving distance that she's always wanted to try. 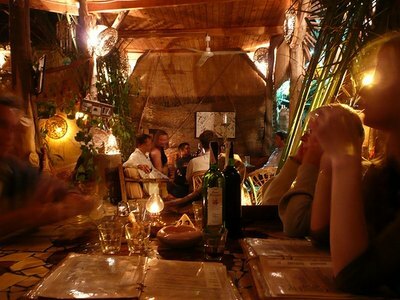 Make reservations at the restaurant you decide upon and inform them of the special occasion you will be celebrating. Ask if they have a room you could reserve or if you would be able to decorate the table or add balloons to her chair. For a fancy restaurant, simply adding a bouquet of her favorite flowers with a card at her seat (before you are seated) may be enough. But go easy: Dining at a sophisticated establishment may lose its luxurious and romantic ambiance if you add typical birthday decorations. Patrons dine in an elegant restaurant, complete with a classy ambiance. Hire a chef to prepare a sophisticated meal in your home for a dinner party of two. Enjoy a cocktail and her favorite appetizer by a fire (or candles if you don't have a fireplace) while sipping a favorite wine. If she doesn't have a favorite wine, ask the chef or a vineyard to suggest a spectacular 50-year-old wine to honor your wife's 50th birthday. For a romantic solution, consider taking him to a fancy hotel out of town, or a couple of towns over. 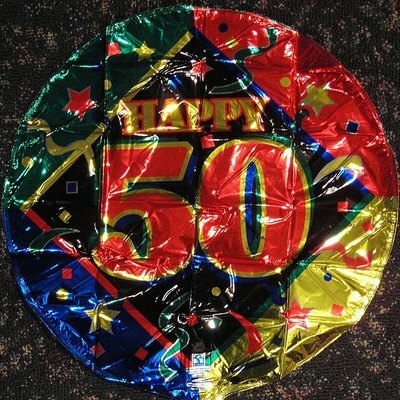 Let the manager know you are there to celebrate his 50th birthday and have the room prepped according to your instructions. If it's not possible to have the hotel staff ready the room, do it yourself earlier in the day or enlist the help of a good friend. Rent a jacuzzi suite and have rose petals sprinkled around the room and on the bed. His favorite wine or champagne could be already chilled in a bucket with two glasses near the jacuzzi. Candles should be set up all around. Order room service and enjoy the night together. Take her back to the restaurant where you went on your first dinner date. If it's not around, or not possible, try another meaningful place that holds memories for you both. If possible, get away for the weekend to the city she loves visiting or has always wanted to go. Take her to the best restaurant you can find in that city with a great view. Take a dinner cruise or a mini-cruise where you can arrange to have a special song played during dinner, or take dinner in your cabin on the balcony. 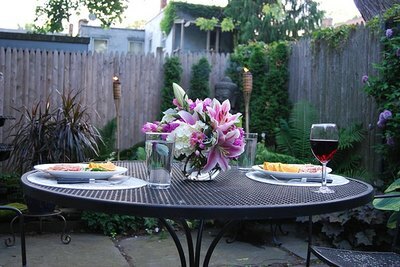 Romantic dinner table for two in the garden. Draw attention to the reason you are celebrating in the first place, his 50th birthday, by introducing a decadent dessert. 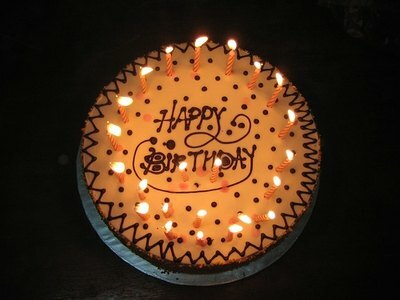 Birthday cakes can be simple chocolate or vanilla flavored to raspberry- or lemon-filled creations. Decorate the cake with a design that fits him, such as his favorite hobby or most treasured possession. Opt for cheesecake, cookies, ice cream, strawberry shortcake or whatever his favorite dessert is. Mix special margaritas or rum concoctions for her if she enjoys mixed cocktails. Try Pina Coladas, Mojitos, Mai Tais, Bahama Mamas or Long Island Iced Tea. If she enjoys tequila drinks, purchase the best tequila you can afford. Other alcoholic drinks to consider include a keg of beer, wine or champagne. Choose the type of alcohol she typically consumes. The party is in her honor, after all.